Conversational interfaces (voice assistants and chatbots) have not lived up to their launch hype, due to how hard it is to design and build conversations which obey the subtle nuances of human communication and language. However, these technologies – when they are implemented knowing their limitations – are still valuable when designing multi-channel experiences. We’ve user tested chatbots which have been designed to answer simple questions where possible, and to gather all the information a live chat agent will need to answer more complex ones. A well-designed chatbot can effectively triage or sort customers, helping some immediately and reducing the time that an agent needs to deal with others. 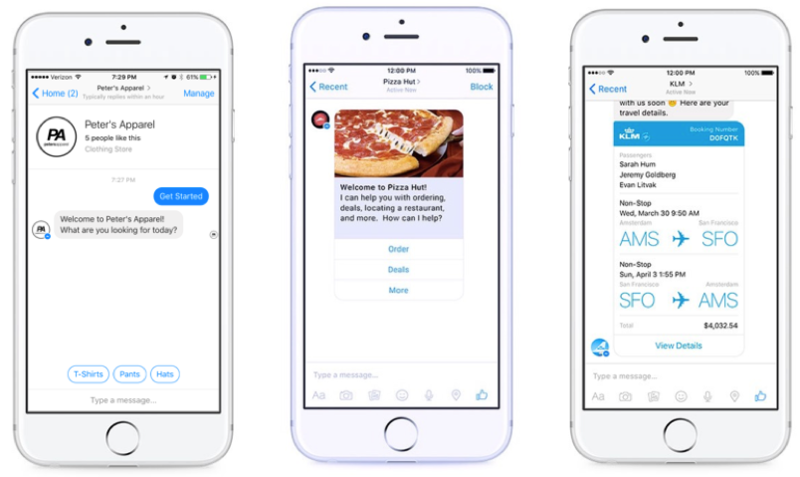 Here are some reasons why chatbots can create a more effective experience – for both customers and customer service agents. As well as utilising conversational flows to create a natural feeling, visual interface elements like menus and quick buttons allow options to be selected far more easily than typing or speaking – while helping to reduce the likelihood of errors. If the conversation is taking place in an app like Facebook Messenger, it can be allowed permission to give notifications and reminders for key tasks outside of the app itself. Other channels can send emails, which is still useful. In global research commissioned by LivePerson in 2017, 71% of participants preferred speaking to a chatbot over a human for checking account balance, while for more complex inquiries requiring more trust in the system, this number reduced: only 46% asked would make a payment with a bot. If the conversation takes place in an app, it is recorded so the user has a record of what was said, and they can go back to refresh their memory and not have to ask again. In US research commissioned by OpenMarket in 2017, 63% of millennials preferred receiving texts over calls because they were felt to be less disruptive. Although the conversation in our case would be instigated by the user, it is likely that there would still be a preference for digital messaging. Need help designing a chatbot for your users? Get in touch, we’d love to help. This post was written by Juliet Rowley. Would you like to share it?